I love wearing lipstick, I think I look dead without some colour on my lips! I don't have a massive collection but it's worth a show, I really want to add some MAC and Topshop lip colours as they have some beautiful colours to offer. Give me any suggestions of lipsticks that you think I should try! Kate for Rimmel, 107- This is a really lovely matte shade, and looks beautiful with really simple eye make-up to keep the attention on the lips. Elizabeth Arden, Sugar Plum Shimmer- This shade is pretty much the same as a few of the others, but it's my favourite out of the few. Elf, Gypsy- I love this colour, it's probably my favourite colour of the bunch it's a matte berry shade. Rimmel, Sugarplum- I don't really use this one as it's very similar to the Elizabeth Arden one but just a bit purpler. MUA, ?- Now this lipstick is the brightest of the bunch, hot pink jut looks so good on the lips. Unfortunately, I do not know the name of this. Rimmel, Rose Passion- Can't beat a red lipstick, I definitely need a bit of variety on my reds. Natural Collection, Berry Blush- I'm not a massive fan of this one, I don't think it matches my skin-tone very well., but it's still a lovely colour. Elf, Classy- This is the same formula is the other Elf lipstick, which I personally think is really nice, the colour is gorgeus too! Natural Collection, Pink Orchid- I love this one, this is the lightest of the pinks that I have and the shimmer to it is lovely. 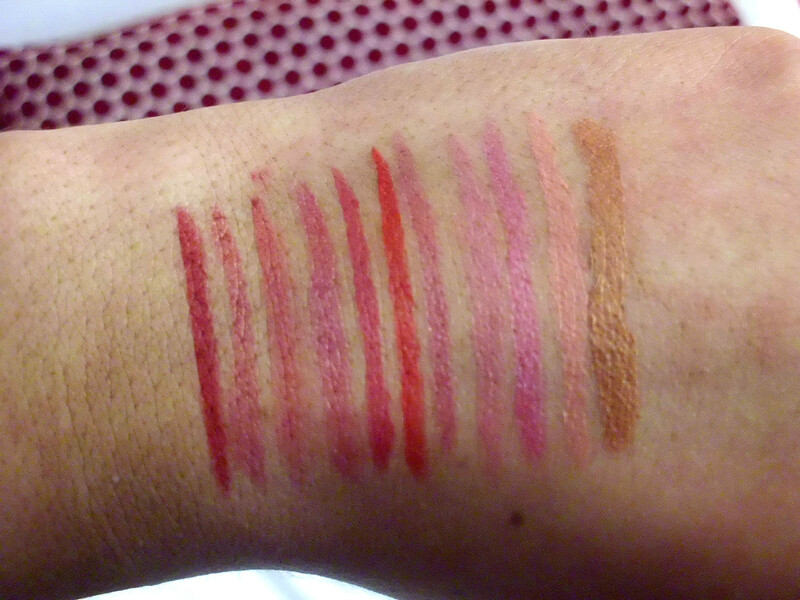 MUA, Juicy- This is a beautiful colour, if you put it on over a red lipstick, the colours look beautiful together. Versace,?- I really don't wear this one at all the golden tone does not suit me, but it's gorgeous still. These are swatched in the order they are shown in the previous picture, my camera had a hissy fit at this point for some reason, so sorry the pictures are not fantastic. I made a rookie mistake and had already finished my make-up before this post so I couldn't show them on my lips or I would have ruined my make-up! 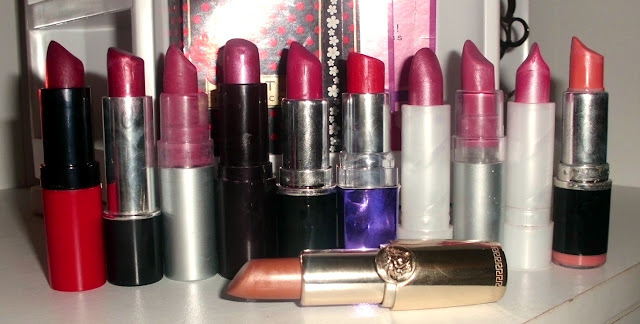 I really don't have that many lipsticks, I should invest in some others! Maybe you'll see a haul featuring just lipsticks.Hope you're all well, becciixx. great collection :) nice colours! Wish I Could Wear a Midi. Nothing wrong with wearing a guy's hat. Panic at all stations- Update! Battle of the Bright Dresses. Power of the Pastel Dresses. War of the White Dresses. Love for Bath & BodyWorks.